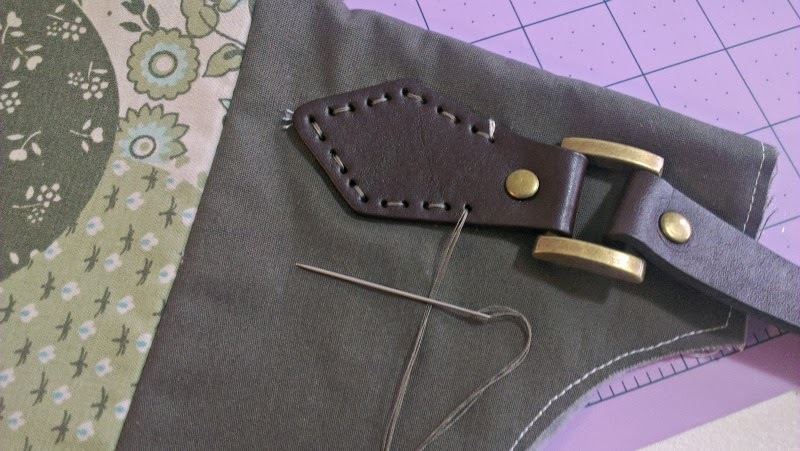 Using leather handles makes your bags seem so luxurious, and often store bought! They are pricey, but they're really easy to attach. 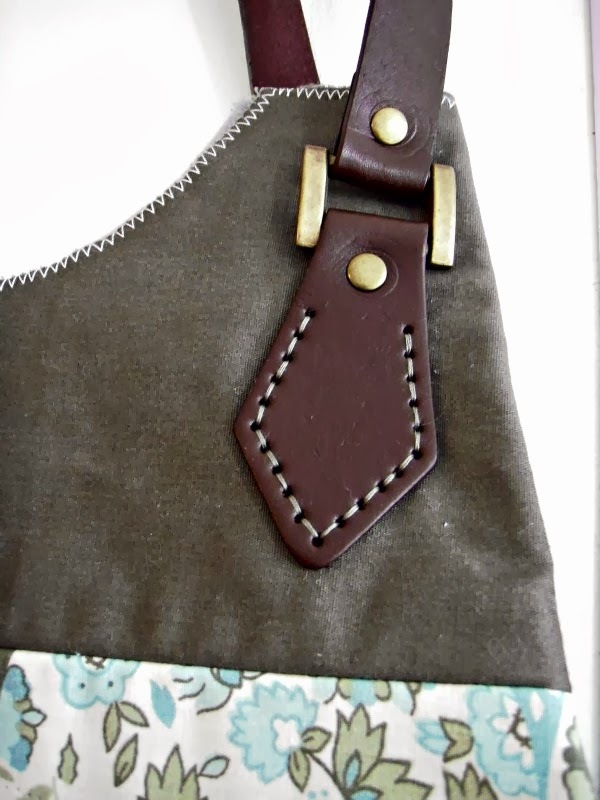 I bought my leather handles from bag-clasps.co.uk, but due to the price of them, if you can find any on bags in the charity shop, or in your wardrobe that you don't want, use them! Whilst they are leather and have a lovely smell if you catch them with your needle, they're not great leather, but they still demand a premium price. Get vintage if you can! Make up the outside of your bag, and stabilise it as your pattern describes, whether it's with soft & stable, felt, fusible fleece etc. 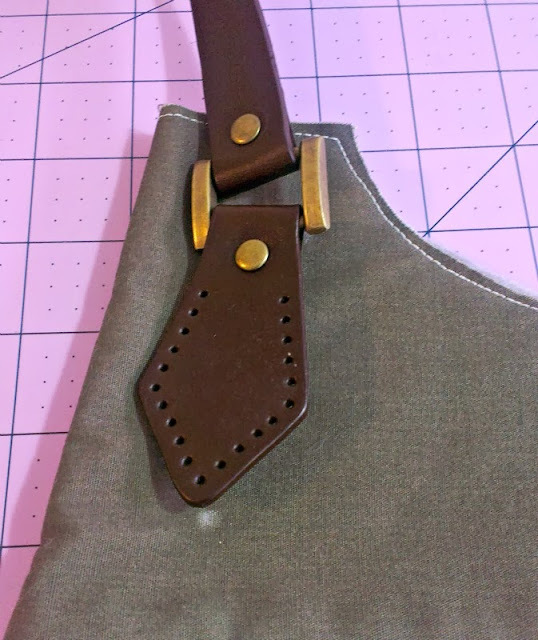 First of all, I started with placing my handle end on my bag, sort of where I wanted it. 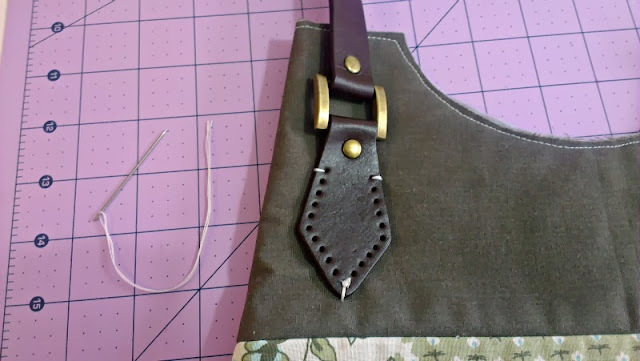 I made sure to leave a 3cm gap from the top and inside side, so that when I stitch the lining in, and then top stitch, I won't catch the bulk of the handle. See that buckle-y bit at the top of the handle end? 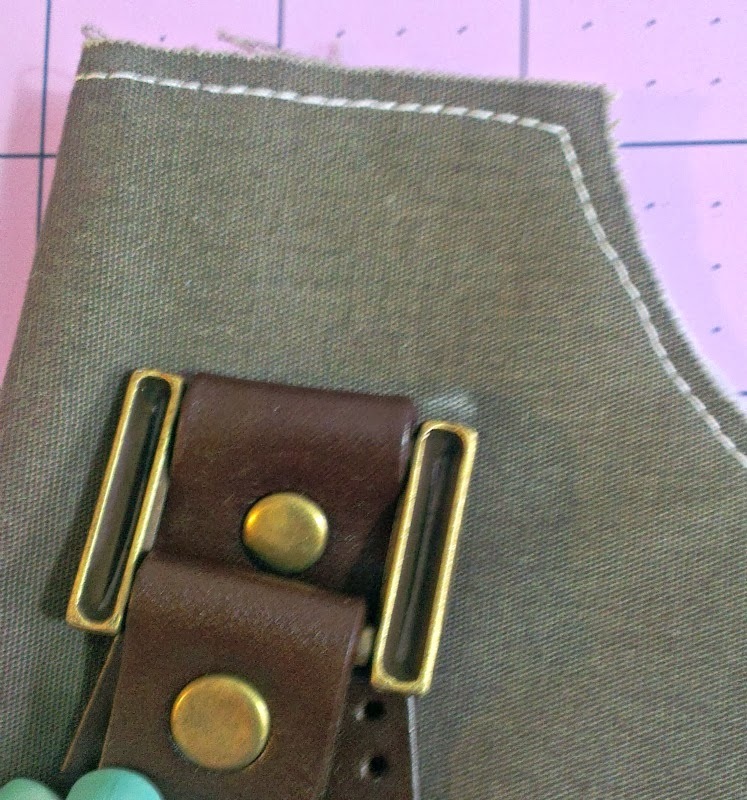 That wants to be at least 3cm from top & side so you can fold the handle back and have enough room to sew. I marked the top and the bottom of the handle end with a tiny bit of tailor's chalk. I wouldn't recommend using my favourite frixion pens on a dark fabric, they tend to bleach it a bit! Next I used a contrasting colour to tack it into place, to make sure it doesn't shift around during sewing. Next I chose a green thread, 100% polyester guterman (if anyone's interested!) and doubled it over. Then I threaded the doubled end through the large eye of my sharp needle and knotted the end. It gave me 4 strands in total. Starting from one side, and from the back, push your needle up through the first hole, and down through the second. Push it up through the third hole, and down through the fourth, all the way around as shown below. I like to hold my hand inside and then my thumb holds the handle end down on the outside. 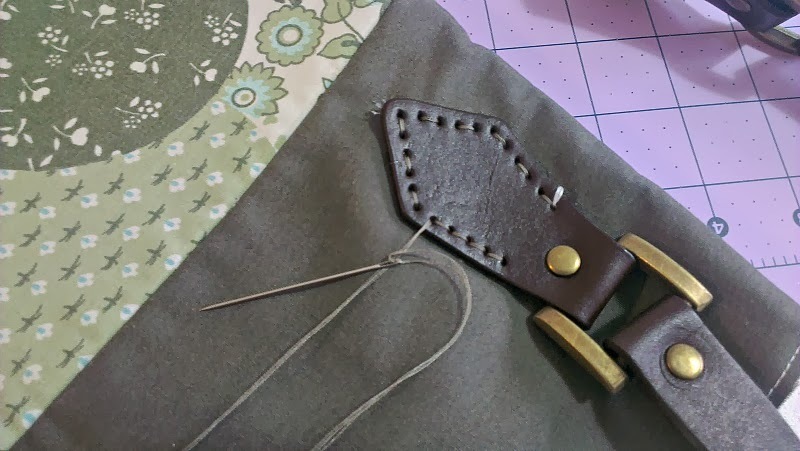 Sometimes it's hard to find the holes, so poke your needle through from the right side, wiggle it around a little and then you can see where the hole is from the wrong side. 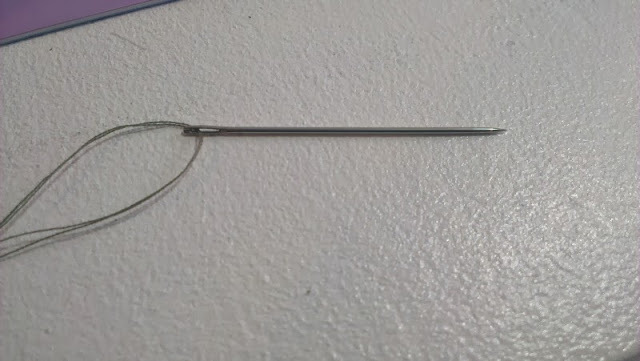 When you get to the other end, you should have your needle on the outside, through the final hole. Next push your needle through the last but one hole. 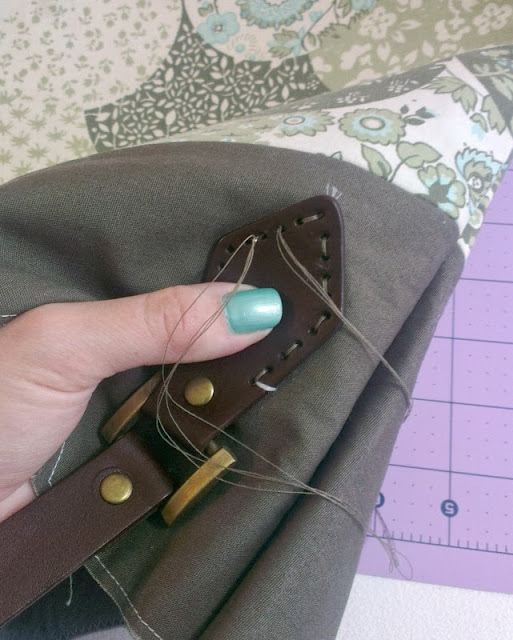 Continue around your handle, towards the start, repeating your stitches as you did on the first go round, up and down. You'll notice that your stitches are on all in the gaps left from your first time around. One you get to the end, or back to the start rather, secure your thread on the wrong side of the bag. As you can see, I removed the basting stitches as I came to them. Repeat for the other three handle ends. You're ready to insert your lining as your pattern describes! 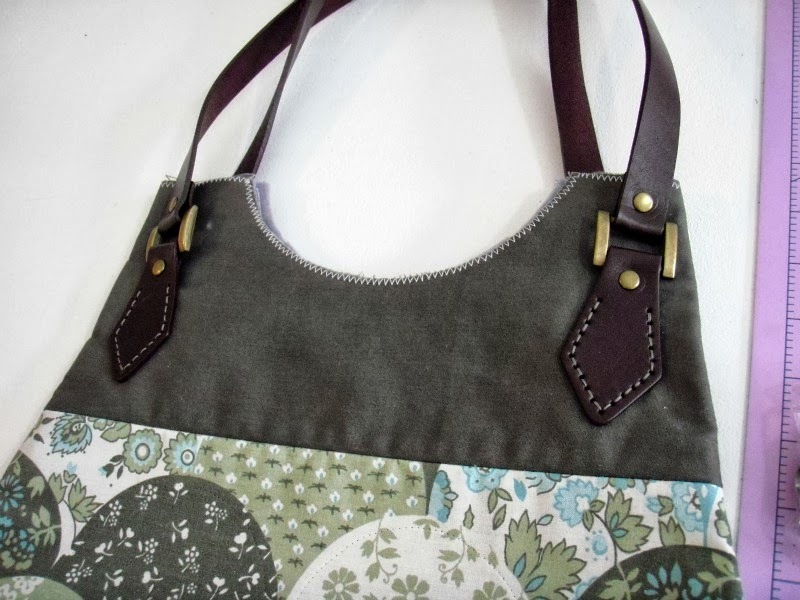 If you make a bag with leather handles, I'd love to see it, even better if it's from one of my patterns!